Crown Pools began as a pool and spa construction company back in 2003, started by Gary Scott & Nicholas Burnes, in the North Brisbane suburb of Redcliffe. Working out of a shed in the industrial area they begun to provide the final pool handover & lessons to clients from the construction company, such as free instore water testing and advice, & onsite pool maintenance programs. They quickly saw the need to extend beyond simply designing and building pools & spas and in 2005 created a separate retail division, The Crown Pool Shop providing all of the gear, chemicals and accessories required to maintain and enjoy your pools & spas all year round. While initially set up to cater to customers of the pool construction side of the business the retail store provides goods and services to anyone in North Brisbane and surrounding regions. A decade on and the Crown Pool Shop has grown into a team of 12, including 4 onsite service technicians. Gary’s son, Patrick Scott, first started in the pool industry as a teenager in high school, helping out on school holidays and weekends. Getting his feet wet and building experience and knowledge in the construction of swimming pools. He now heads up the retail supply side of the company, along with his wife Alicia and a team of dedicated pool & spa professionals. And today, as Patrick & Alicia’s family grow, they have rebranded the retail side of the operation as the Crown Pool Superstore, continuing the dream of providing quality advice and products to clients throughout North Brisbane & South East Queensland. 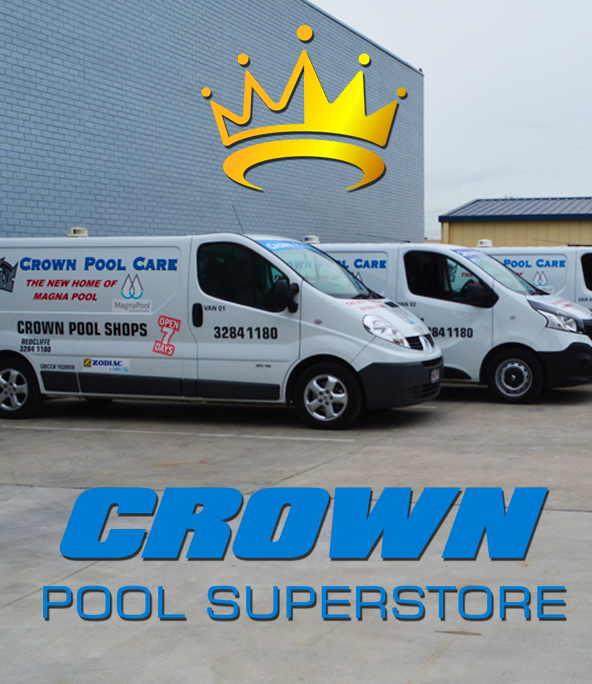 In addition to the retail shop, the Crown Pool Superstore website has extended their services to a 24/7 shopfront as well as a convenient way to book and organise your pool & spa servicing. continuing close relations with local Real Estate Agents & maintaining their properties. At the Crown Pool Superstore you can always be assured that “Our Experience is Your Guarantee of Quality”.